More Than 100 Petroleum- and Emissions-Free Vehicles to Go to California, New York and Washington D.C.
LOS ANGELES / NEW YORK – Chevrolet fuel cell electric vehicles will be seen on the streets and driveways of Los Angeles, New York City and Washington D.C., beginning today, in the largest market test ever of its kind. 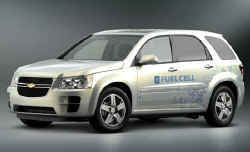 Customers in suburban Los Angeles, New York City and Washington, D.C. will begin driving more than 100 Chevrolet Equinox Fuel Cell electric vehicles as part of a comprehensive deployment plan dubbed “Project Driveway.” It constitutes the first large-scale market test of fuel cell electric vehicles anywhere. A variety of drivers – from regular families to celebrities – will have free use of an Equinox Fuel Cell electric vehicle and the hydrogen fuel it needs to make electricity onboard. The average family will get one of the vehicles for three months and be required to report their experience to Chevrolet. “These families volunteered to be part of something big," said Ed Peper, Chevrolet general manager. "They care about the environment, and they want to help solve our nation’s energy issues. They are pioneers, and we are pleased they have joined our team. General Motors Corp. will apply what it learns to the advancement of electric drive vehicles. 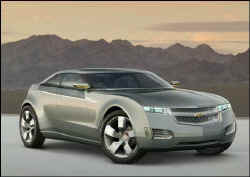 One example is the Chevrolet Volt with GM’s E-Flex system. The "E" stands for electricity; the "Flex" for the many ways to make and store electricity on board. These technologies reduce emissions, lessen the country's dependence on oil and move toward sources of energy that can be replenished or renewed – wind, solar, plants, geysers, waves or even garbage. Enabled by GM’s fourth-generation fuel cell propulsion system, the Equinox Fuel Cell electric vehicle is a fully functional crossover vehicle. It is expected to meet all applicable 2007 U.S. Federal Motor Vehicle Safety Standards, and is equipped with a long list of standard safety features including driver and passenger frontal air bags and roof rail side-impact air bags; anti-lock braking system (ABS); StabiliTrak stability enhancement technology and OnStar.